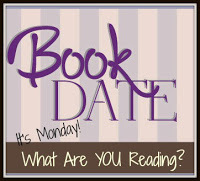 Book By Book: It's Monday 6/11! What Are You Reading? It's Monday 6/11! What Are You Reading? Whew, another super hectic week! I keep thinking things will settle down, but they haven't yet. Maybe this week (hope springs eternal!). No, really, this should be a quieter week here. After much preparation, rushing around, and a family dinner Friday, we sent our 20-year old son off to Europe this weekend. He is on a 3-week long study abroad program - two weeks in the walled city of Volterra, Italy (in the Tuscany region), plus a week-long Caribbean cruise to ports in Italy, France, and Spain. Oh, yeah, this is one tough assignment - and for this, he gets 3 credits! I'm a bit jealous but mostly thrilled that he gets this opportunity. Our older son is still going through a rough period physically, due to his Lyme disease and other tick-borne infections. We're not entirely sure why he's been worse lately, though a trip to his Lyme specialist (one of those unplanned things that made last week so tiring) led to a new avenue to explore, so we are cautiously hopeful. He will be heading to Firefly, a HUGE outdoor concert held every year here in Delaware, on Thursday, so it should be very quiet toward the end of the week at home. I hope to finally get some writing done and some new pitches sent out. I finished my next review book (before continuing with my Big Book Summer): My Pretty Face by Robyn Harding. This is one of those domestic suspense novels that have become so popular, about two moms who become friends, though one is hiding a secret past as a murderer. I figured out most of it by about the halfway point and the mystery is revealed pretty early, but this novel is more about why than who, exploring questions about forgiveness, friendship, and redemption. I will share my review after it is published on Shelf Awareness next month. Next, I started another review book, Where the Crawdads Sing by Delia Owen. I chose this one to both review and interview the author, and boy, did I choose well! I am absolutely loving this novel set in the coastal marshes of North Carolina, about a young girl left to fend for herself after her family abandons her. There is also a murder mystery and some romance woven in. It's a very immersive novel, with the author bringing the unique coastal marsh environment to life. I can't wait to talk to the author later this month. On audio, I finished listening to The Lightkeeper's Daughter by Jean E. Pendziwol, an intriguing novel that reminded me a bit of The Orphan Train, with its mix of past and present. A modern teen is sentenced to community service at a retirement home and gets to know one of the residents, who is wondering about secrets from her own childhood spent on a remote island where her father was the lighthouse keeper. It was excellent, with warmth and emotion but also plenty of surprises! Now, I am listening to The Reason You're Alive by Matthew Quick. This is classic Quick, with a powerful story told by a unique narrator of the type that readers rarely hear from, combining emotional depth with laugh-out-loud moments. It's about a Vietnam vet who still struggles with PTSD and other effects of his time in war but loves his son (whom he has nothing in common with) and his young granddaughter. The narrator at first comes across as crass, outspoken, and offensive - and he is all of those things! - but the more you get to know him, the more you see the layers behind that initial impression. I am loving this one, as I have every Quick novel I have read. My husband, Ken, is reading Burn by Nevada Barr, a book I gave to him for Christmas. He and I love Barr's Anna Pigeon thrillers because they are all set in National Parks (which we love), starring a park ranger. I chose this one specifically because it is set in New Orleans, where we used to live (and still one of our favorite places in the world!). And Ken chose it now because it is a Big Book! Our son, Jamie, 23, the new graduate, finished reading book 8 of the Wheel of Time series by Robert Jordan, The Path of Daggers, and is now onto book 9, Winter's Heart. He loves this series. It's Big Book Summer all year-round for him; he rarely reads a book with under 400 pages! This one is "only" 800 pages. He is thrilled to get back to reading after the past months of struggling to finish school. Summary of Books Read in May - low quantity but good quality! 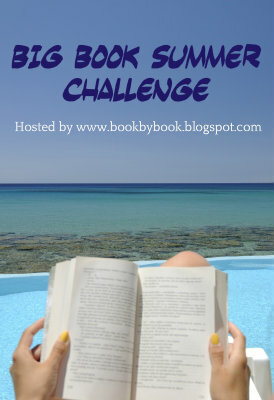 The 2018 Big Book Summer Reading Challenge has begun, and there is still plenty of time to join! It's easy-going, like summer - you only need to read one book with 400 or more pages sometime between now and the end of summer (early September) to participate (though of course, you can read more Big Books, if you want to). It's great motivation to tackle some of the bigger books on your shelves or TBR that usually get overlooked. Check out the details at the link and join the fun! The Lightkeeper's Daughters sounds fascinating (and after reading through several Goodread's reviews, I'm adding this one to my TBR list). I thought it was YA, but it looks to be adult fiction. Is that correct? Either way, it looks like something I would really enjoy. Thanks for sharing! And I'm going to jump into your Big Book Summer Challenge with both feet. I mentioned it in my #imwayr post, today. Should I write a separate post about it? I certainly can. Hoping I get a good jump start on one of my "big books" this week! That's right, Shaye - one of the narrators in The Lightkeeper's Daughter is a teen but the other one is elderly, and it is an adult novel. Explaining the challenge in your Monday post was fine - thanks for linking back to the challenge page. And welcome to the Big Book Summer! I just added Where the Crawdads Sing to my TBR. I will soon be joining up on your Bib Book Challenge as I finished a re=read of a 480 page book last week on the road trip. Sorry we didn't have time to link up with you since we were so close but the move consumed us and did the pull to get home. I just finished it today, Anne, and it was SO GOOD!! How wonderful that you live in the same area as Joe Biden, I heard an interview with Oprah and him that made me want to listen to the book. I know its going to be sad because its about his son dying, but I love his values. Yay for Delaware all the way from NZ. Yes, he's our hometown boy! His family's home (estate is a more accurate term!) is just a few miles from where we live. Hey, at least now most people have heard of our tiny state! Wow, I’m envious of your son’s study abroad program. That sounds fun. Sorry that your other son is having health problems. I hope he feels better soon. Have a good week! Thanks, AJ - this has been a long road for our family - I;ve been sick for 16 years and our oldest son for 14 years (our youngest had the same immune disorder only milder for 10 years but is now fully recovered). So, it is amazing to us that he is now well enough to travel the world on his own! He texted me today and said he's having a great time - went to a cheese tasting in Tuscany yesterday - he's living it up! I just finished a fabulous YA: Refugee by Alan Gratz and am about to begin Solo by Kwame Alexander. Oh, that IS a fabulous book, Helen!! Refugee was amazing. I think I have Solo on my audio backlog, though I'm not sure how a novel-in-verse will work on audio. I'll move it up my list! I just borrowed Lucinda Riley's Seven Sisters as my personal bigbook challenge - let's see whether I'd be able to follow through. :) Great opportunity indeed for your son to spend three glorious weeks in Europe. We spent a week in Tuscany last year, still one of our most unforgettable vacations. It's Monday 6/25! What Are You Reading? Saturday Snapshot: Happy Father's Day! It's Monday 6/4! What Are You Reading?